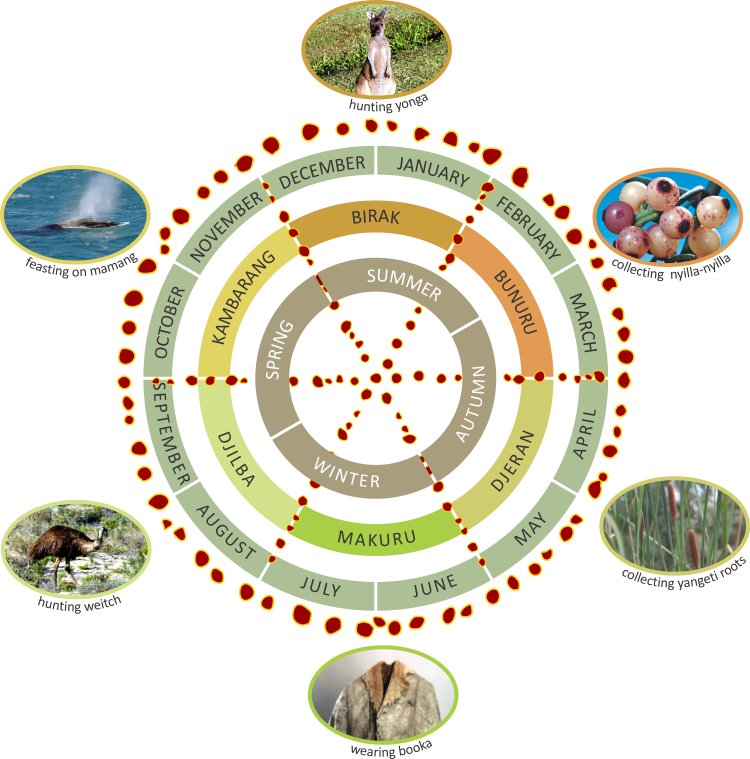 The Nyungar year is divided into six seasons as can be seen in the calendar wheel. The seasons were not defined by strict dates but by changes in temperature, wind, rain and food availability. Nyungar were not seafaring people but used all the resources of the coast, the coastal plain and waterways, and the scarp. In the warmer months they gathered and hunted plants and animals from the coast and coastal lakes and waterways. In the colder months they retreated from the coast to the hills for shelter. Click on the oval image panels surrounding the main calendar diagram below for more information on each season. Traditional owner the late Fred Collard describes how Nyungar move around with the seasons. The late Joe Walley, traditional owner of the Pindjarup region, talks about bidi (trails), food and seasonal travel. 1. Collard, F. Oral transcript, unpublished. 3. Bennell, B. Life according to the six seasons. In, Aboriginal Culture Values, Technical Report 6. Southwest Catchment Council, pp. 12-14. Undated. 4. Daw, B., Walley, T. & Keighery, G. Bush Tucker Plants of the South West. WA Department of Conservation and Land Management.